Scientists at FTMC Department of Laser Technologies have discovered a highly efficient laser energy utilization and its application in the rapid formation of bio-inspired friction-reducing surfaces that are expected to reduce fuel and airplane costs in the future. Scientific Reports 8, Article number: 17376 (2018). Ultra-short laser pulses are frequently used for material removal (ablation) in science, technology and medicine. However, the laser energy is often used inefficiently, thus, leading to low ablation rates. For the efficient ablation of a rectangular shaped cavity, the numerous process parameters such as scanning speed, distance between scanned lines, and spot size on the sample, have to be optimized. Therefore, finding the optimal set of process parameters is always a time-demanding and challenging task. Clear theoretical understanding of the influence of the process parameters on the material removal rate can improve the efficiency of laser energy utilization and enhance the ablation rate. In this work, a new model of rectangular cavity ablation is introduced. The model takes into account the decrease in ablation threshold, as well as saturation of the ablation depth with increasing number of pulses per spot. Scanning electron microscopy and the stylus profilometry were employed to characterize the ablated depth and evaluate the material removal rate. The numerical modelling showed a good agreement with the experimental results. High speed mimicking of bio-inspired functional surfaces by laser irradiation has been demonstrated. The activities of the FTMC Department of Laser Technologies includes Nanophotonics, Laser Science and Applications, the Development of Optical Component of Lasers, the Design of new Fiber and solid-state Lasers and their Application for Precise Material Processing. The research focuses on the development of complex dielectric optical coatings, high-pulse energy fiber lasers, and amplifiers. Nonlinear interactions by generating harmonics or combining laser beams are used to increase laser power. High-average power solid state lasers excited by diodes with synchronized modes or modulated quality of solid-state lasers are developed for specialized technological applications. 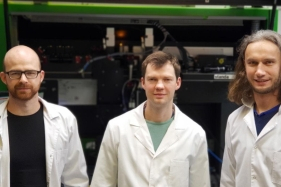 New interactions between laser radiation and materials are looking in order to develop and install laser microfabrication technologies for the modification of metals, semiconductors, dielectrics, as well as for the modification of thin layers of solar cells. Research is also being carried out by modeling, developing and characterizing nanophotonic structures, waveguides, and metamaterials for light control.